Both terrifying and thrilling, lightning is one of the most obvious signs of the immense energy involved in severe storms. Detecting lightning strikes is important for improving public safety during severe weather, warning land managers of possible wildfire triggers, and protecting electrical and transportation systems. Earth scientists are interested in detecting lightning because it helps pinpoint where and when strong convection—the rising of air— is occurring. Convection is one of the Earth system’s key mechanisms for “evening out” heat and moisture across the globe, and yearly maps of lightning flashes may help scientists identify how parts of the Earth's climate system, such as severe storms and precipitation, might be changing over time. 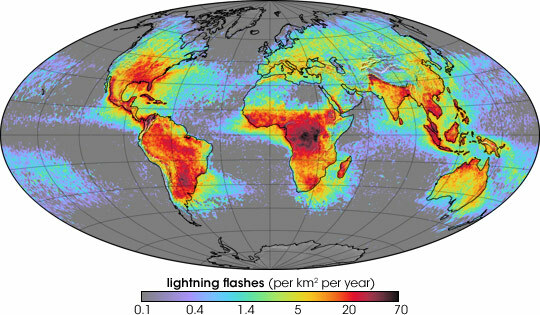 The map above shows the average yearly counts of lightning flashes per square kilometer based on data collected by NASA satellites between 1995 and 2002. 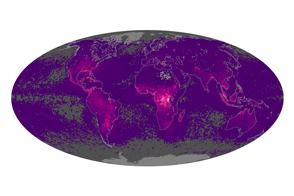 Places where less than 1 flash occurred (on average) each year are gray or light purple. 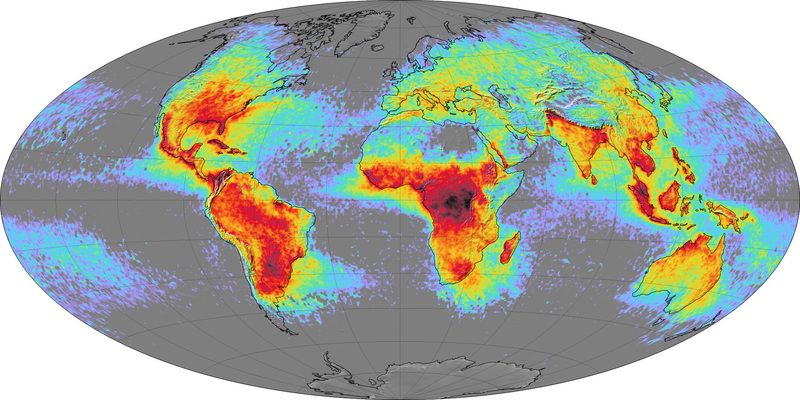 The places with the largest number of lightning strikes are deep red. Much more lightning occurs over land than ocean because daily sunshine heats up the land surface faster than the ocean. The heated surface heats the air, and more hot air leads to stronger convection, thunderstorms, and lightning. 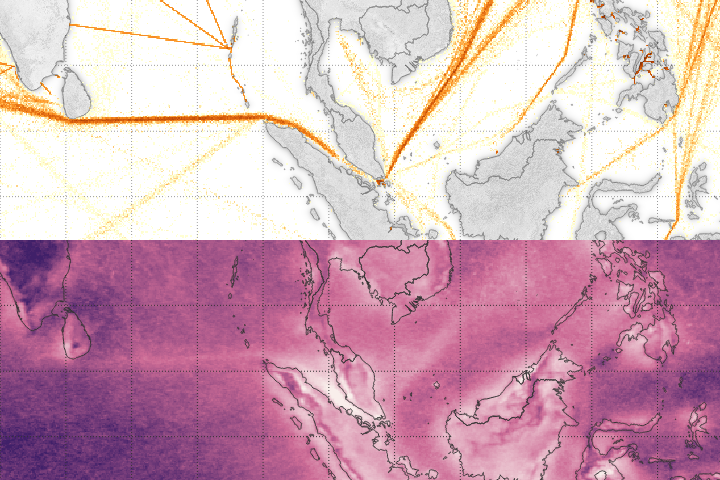 The map also shows that more lightning occurs near the equator than near the poles. This pattern is also due to differences in heating. The equator is warmer than the poles, and convection, thunderstorms, and lightning are widespread across the tropics every day. This image is based on lightning detections from two satellite sensors. 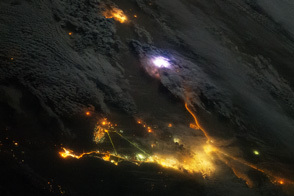 The data include detections made between 1997 and 2002 by the Lightning Imaging Sensor that flies on the Tropical Rainfall Measuring Mission satellite, which is a joint NASA/JAXA (the Japanese Space Agency) mission. The data also include lightning detections made between 1995 and 2000 by the Optical Transient Detector. The lightning team at NASA’s Global Hydrology and Climate Center at Marshall Space Flight Center designs and builds lightning-detection sensors and shares NASA’s lightning data with scientists around the world.